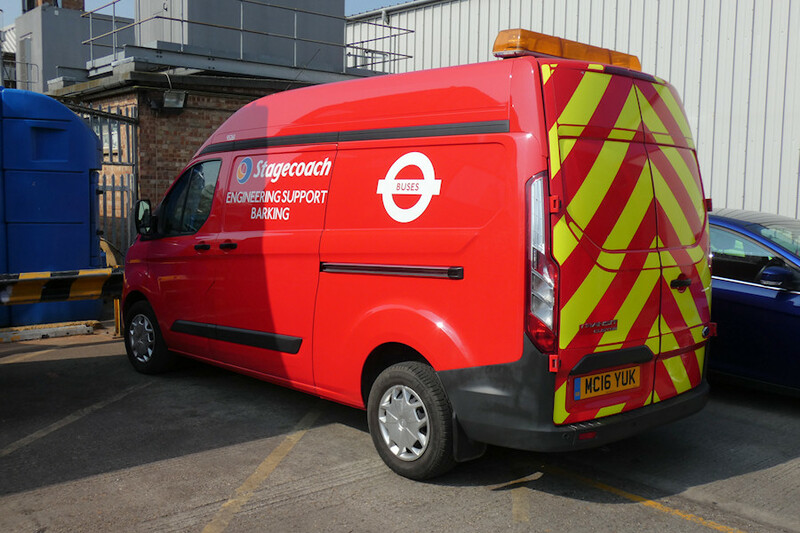 Details: The other service vehicle at Barking Garage during the open day on 30th March 2019 was much more noticeable. Parked in the side yard, MC16YUK was a high-roof Ford Transit Custom van, one of which is allocated to each Stagecoach London garage for engineering support duties. Most (now) carry full lettering, as seen here. And we also now know that this van has Stagecoach national fleetnumber 95261. This is a recycled number, having previously been carried by Bow's YC11KTO. Numbers on the Plumstead van and the new Bow van are not yet known, but the remainder are a mixed bunch, including two in the 907xx range, two in 909xx, one in 931xx and one other 952xx.